Ditch crossings can be quite hard on your car unless the correct technique is used. 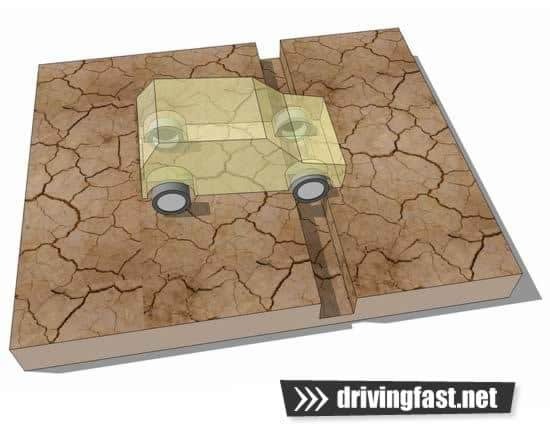 There is a risk of contact with the ground, and loss of traction is fairly likely depending on the size of the ditch. Crossing a ditch straight will cause both front wheels to fall into the depression simultaneously and for the front suspension to compress. This can cause the front of the vehicle to make contact with the ground, or reduce traction to the point where you might become stuck. To negotiate a ditch in a more reliable manner, cross at an angle, allowing only one wheel to enter the ditch at a time. This provides the greatest chance of success by maintaining the best possible traction using three out of the four wheels. Ensure all the traction aids at your disposal are engaged (such as traction control and differential lock). 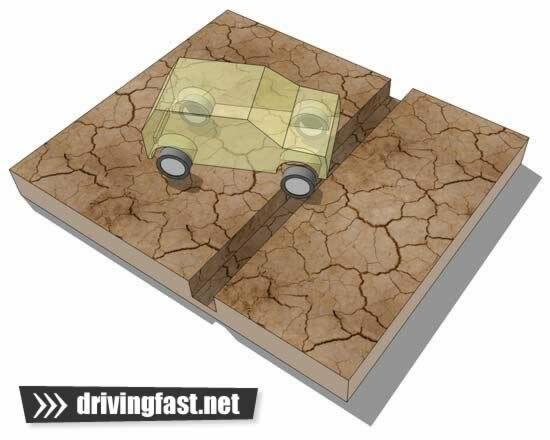 Tackle the ditch at a slow speed, but have sufficient momentum to drive the vehicle through. If you have the luxury of adjustable suspension, ensure the highest setting is selected to prevent any contact with the ground. Be prepared to increase the throttle slightly if wheels start to spin.